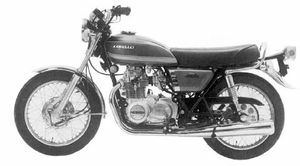 The Kawasaki KZ400S was a 400cc, twin cylinder, four stroke, street motorcycle manufactured by Kawasaki from 1975 through 1977. 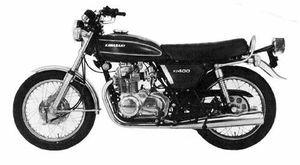 Remarks: Similar in appearance to the KZ400D, except this has a drum brake on the front, and no electric starter. From late '75 model, tire tread patterns changed. Major Changes: Color, marking, front fender, and grips. Tachometer and center stand discontinued. 2-into-1 exhaust, locking tank cap, and three-fuse system adopted. Max. horsepower lowered to 34 HP. Major Changes: Color, marking, carburetors, and ignition timing. This page was last edited on 10 December 2010, at 02:51.